"Bankers hours and bankers' arrogance because, well, they are bankers and the bankers' stooges..." might be the best way to view the way in which the seven members of the Chicago Board of Education handle their monthly meetings. 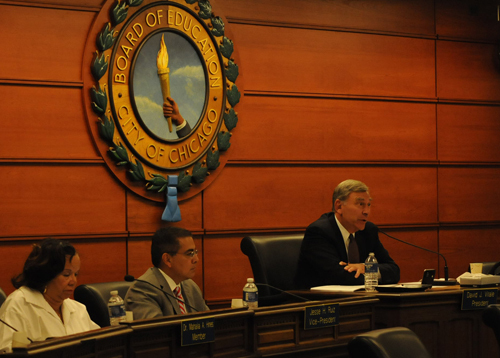 As usual, the meeting of the Chicago Board of Education June 27, 2012, was supposed to begin at 10:30. with public participation. Once again, the public was treated to the infamous "Vitale Stall..." which is what they have implemented to discourage people from attending and signing up for Board meetings to speak (except their chosen shills). During the first year of their time as members of the Board of Education of the nation's third largest city, Board members have devoted more and more of their time to silencing the voices of those who disagreed with their policies. Above, during the June 27, 2012 Board meeting, are (left to right) Board members Mahalia Hines, Jesse Ruiz, and David Vitale (the millionaire banker who is President of the Board). Substance photo by George N. Schmidt.The "Vitale Stall..." is the new policy whereby the Board holds most of its meeting for an hour or two (or more) after convening late on the day of the Board meeting. This means that public participation rarely begins before noon and often not until as late as one o'clock. Anyone who comes from a school by bus is thus excluded from testifying, while the Board's shills and touts (Stand for Children; Advance Illinois; Democrats for Education Reform; etc.) have already had their day attended to, as we've reported. (We reported that people from CPS hold places in line for the Stand for Children and DFER touts). On June 27, 2012, members of the every-increasing CPS Communications Department staff tried to tell reporters that "it has always been this way," but were called out for lying. During his first year as President of the Chicago Board of Education, since his appointment by Mayor Rahm Emanuel, David Vitale has worked with CPS and City Hall officials to develop ways to reduce and thwart most public participation during the brief once a month meetings of the Board. Vitale's main method, now called the "Vitale Stall," consists in putting virtually all business of the Board before the beginning of public participation. Under all the Board presidents since mayoral control began in 1995, there were efforts to encourage public participation, and the public testimonies rarely began after 11:00 a.m., and often immediately at 10:30 a.m. when the Board members assembled. 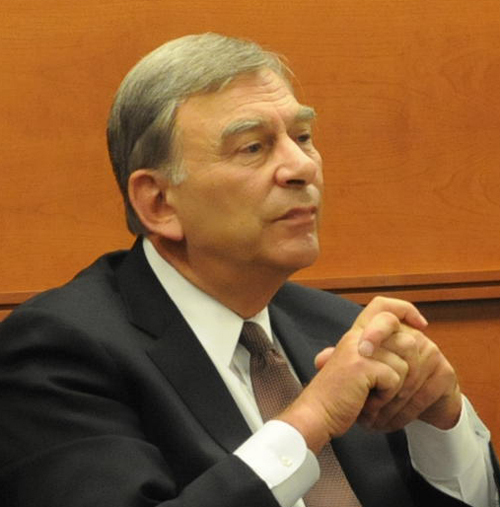 Vitale's design has been to force members of the public to wait as long as possible to testify, and for several meetings the Vitale Stall has resulted in the public participation beginning well after noon. In more and more cases, parents who had arrived at CPS at dawn were forced to go home, because of parking, child care, or transportation arrangements, before they got their chance to talk to the Board. Substance photo above June 27, 2012, by George N. Schmidt.Under former CPS Board Presidents and CEOs, going back to Paul Vallas, the beginning of the meeting was always for public participation. Reports from the Chief Executive Officer and others were always delayed until after the public had been able to speak, in recognition of the fact that many parents had to take a day off from work in order to attend the Board meeting, and some were also enduring the expensive parking costs of Loop parking. During the first 16 years (1995 - 2011) of mayoral control "school reform," beginning in 1995 when Mayor Richard M. Daley appointed Paul Vallas as CEO and Gery Chico as Board President, the public was always able to begin speaking by not later than 11:00 a.m. (and in most months, that was considered late). A review of the tapes of the Board meetings and photographs from the meetings (which are time stamped by the Substance digital camera) shows the same pattern for more than a decade. Whether the Board President was Gery Chico, Rufus Williams, Michael Scott, or Mary Richardson Lowry, the public was always treated with respect. Since the arrival of David Vitale, Henry Bienen, Mahalia Hines, Jesse Ruiz, Penny Pritzker, Roderigo Sierra, and Andrea Zopp on the Board, the outright hostility of the Board members to the public has become more and more clear at each meeting. AFter one hour of the "Vitale Stall" on June 27, some of the parents who had been waiting all day to participate in public participation were asked by CPS security, on orders of David Vitale, to keep their children quiet. 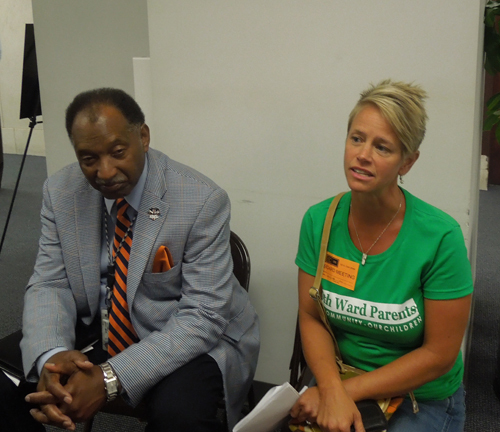 The irony of disrespecting children by the seven members of the Board of Education was lost on Vitale, who pushed the issue until 19th Ward parent Laura Paris became angry at CPS security and was ordered to leave the Board chambers. Paris was forced to sit outside the chambers in a kind of "in school suspension" during the rest of the Board meeting, but the Vitale Stall lasted so long that she and several of her colleagues were left out of the speaking because they had to go home. Substance photo by George N. Schmidt.By the time Rahm Emanuel's Board was settled in its positions, the "Vitale Stall" was in place. Members of the public were denied access to the Board meetings, while Board staff held down seats marked "reserved" in the Board chambers. Some were told that there was not even room in the "Holding Room" on the 15th Floor of the CPS headquarters (confirmed by Substance June 27), while parents who objected were threatened with arrest or removed from the Board chambers, while staff deliberately stalled the proceedings with lengthy and sometimes humorously inane Power Point presentations.